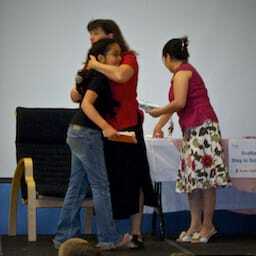 On Wednesday, June 25, 2008 (the final day of school), I had the privilege of attending my niece’s graduation assembly at Radisson Park Elementary School. She was one of seven graduating grade four students to receive a Scotia Capital Stay in School Award in recognition of her current efforts and achievements. Way to go Katelyn! I’ve made a short slideshow/movie of the assembly (including a performance by the choir and the school song). The Scotia Capital Stay in School Program is made possible through a gift from Scotia Capital, which donates the proceeds from Charity Trading Day each year. The fund provides for programs which are designed to support at risk, disadvantaged children and youth and help them to achieve academic success and recognize their current efforts and achievements. It consists of three components, Stay In School Awards, Graduation Awards, and Leap to Learning Awards. The Stay In School Award program was established to recognize elementary, junior high school and senior high school students who are doing exceptionally well in school, given their personal circumstances, and to encourage them to complete high school and move on to a post-secondary education. The award itself is a combination of $50 cash directly to the student and $250 Canada Savings Bond for them to begin saving for post-secondary education. Stay in School Awards was published on Sunday, June 29, 2008 at 1:39pm MDT by Daniel Menjívar and last updated on April 11, 2018 at 9:30pm UTC .